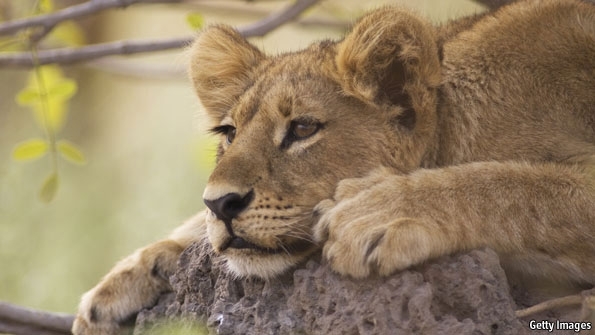 IN A rare bit of good news for wildlife in Africa, last week saw the launch of the world's biggest conservation area stretching across five southern African countries—Angola, Botswana, Namibia, Zambia and Zimbabwe. The Kavango/Zambezi Transfrontier Conservation Area (KAZA) has been in the works since 2003; a memorandum of understanding was inked in 2006, followed by a fully fledged treaty to establish the park in August 2011. The area under conservation has expanded during the process, from under 300,000 to 440,000 square kilometres, nearly the size of Sweden. Kaza encompasses over 20 existing conservation areas and national parks including Victoria Falls, a UNESCO World Heritage site shared by Zambia and Zimbabwe and by some measures the world’s largest waterfall, and the Okavango delta in Botswana. Linking the areas up in this way is meant to allow vegetation to thrive and animals to return to their natural migration routes along protected corridors. Among the park's denizens will be 325,000 elephants, almost half the total number in Africa. The hope is that a co-ordinated approach will be more effective at tackling poaching and other wildlife-related crimes since the five countries can now share patrols and information. Pooled resources should also go further to protect the landscape and attract investors and tourism to the region. Development and the welfare of the 1.5m people living in the park are priorities, too. The parks are to draw on the expertise of the World Wildlife Fund, an advocacy group, in techniques which allow local communities to benefit financially from conservation efforts on their land. This park is just one (albeit the grandest) of a number of transfrontier conservation areas (TFCAs) inside the South African Development Community, a club of 14 countries from the region. As well as addressing environmental problems, which seldom respect national borders, TFCAs have been dubbed “peace parks” by some, because of their beneficial effect on regional diplomacy. The opening of Kaza, then, is an encouraging landmark all round. The Economist Mar 23rd 2012, 15:17 by A.W.